Originally designed and built by Spirit Yachts in 1999 for a Swedish owner, and the only existing Spirit P35 to date, Ali Baba was then sold to two Norwegians who restored her following a devastating fire onboard. 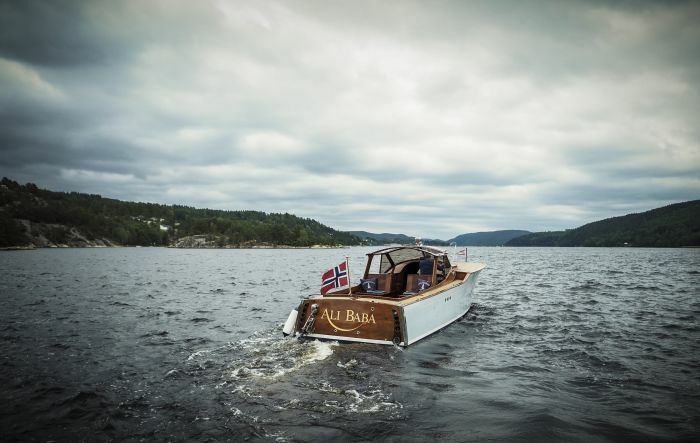 Having purchased Ali Baba and keen to get to know her, new owner James persuaded friend David to accompany him in bringing his new boat back to the UK from Norway. 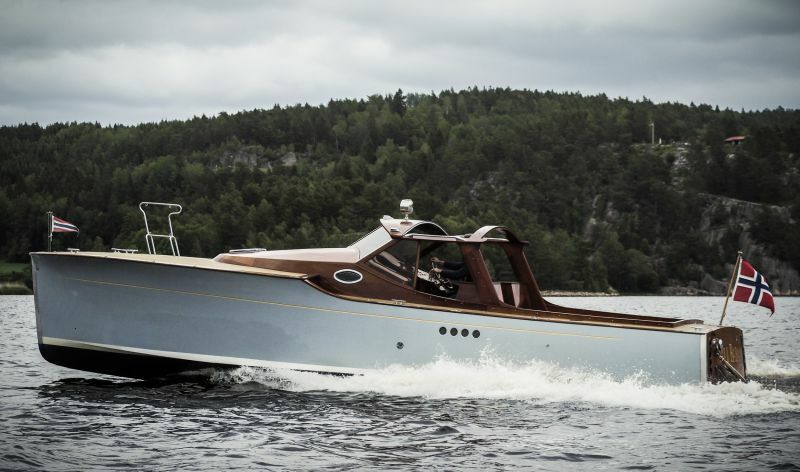 According to James, not much persuasion was needed and, via a trip to Southampton Boat Show to stock up on safety equipment, the pair travelled out to Halden, south Norway to bring Ali Baba back to Spirit Yachts in the UK. Despite the tight weather window and challenge of taking a day boat on a 1,200 mile (2,000km) journey across the North Sea in October, the trip greatly appealed to their sense of adventure. Not knowing how Ali Baba, as primarily a day/weekend boat, would perform, James and David were aware they were asking a lot of her. Fortunately, once out at sea the conditions were kind and all was calm, allowing Ali Baba to easily cruise at 20 knots. From Halden, the pair headed down the coast of Norway to Sweden and then across the sea to Denmark, where they headed to Skagen and finally on to Hirtshals, where they stayed in a hotel overnight. The following day, James and David planned to go to Hvide Sande, approximately 110 miles (180km) down the Danish coast. Despite a slight increase in sea state, Ali Baba was doing a steady 19 knots and they arrived in good spirits at 3.30pm. Having seen the state of their ‘desperate’ hotel, the two promptly refuelled and were back out on the water by 4.30pm to find somewhere more pleasant for the night. The conditions were in their favour, with Ali Baba reaching a consistent 25 knots, and they arrived in Esbjerg, 45 miles (70km) down the coast, at 7pm. On day three the friends departed at first light and headed for Büsum, 110 miles (180km) down the coast in Germany. As the sea state was so favourable, they decided to press on and changed course for northern Holland via Helgoland island off northern Germany. From Helgoland the adventurers changed course once again in the direction of West-Terschelling in the West Frisian Islands, north of Holland. After an exhausting 12 ½ hour day, the pair were shattered and low on diesel. James describes the scene as they came into West-Terschelling, “The tide was by now very low, with shifting sands and two feet of surf making navigation increasingly challenging. Conscious of the conditions, we made the call to head 5 miles back out to sea and come in via the shipping channel. Due to our lack of diesel by this stage, we turned off one of the P35’s two engines and came in on the remaining one. Ali Baba handled extremely well under the circumstances. A well-earned sleep in a hotel overnight preceded another early start on day four. Once refuelled, the destination was Zeebrugge in Belgium, approximately 150 miles (240km) down the coast, with a foreboding force 4 to 5 N/NE on the forecast. At the island of Texel, off the west coast of Holland, and with the wind behind them, James and David decided to head for Great Yarmouth in the UK, which at this point was 105 miles (170km) across the Channel. With ‘decent surf waves’ behind Ali Baba she was reaching 21 knots. Wary of committing to a long passage in a day boat, after an hour they turned the boat around to test the sea state should they have to turn back. Quickly realising the journey back to Holland would be ‘very uncomfortable’, the pair took advantage of the conditions and pressed on. After a night in a ‘less than desirable’ hotel in Lowestoft (with even less appetising food), the pair looked forward to heading down the coast to Spirit Yachts’ base in Ipswich, Suffolk. However, one final challenge lay ahead before they could set off. Lowestoft’s sizeable seagulls had paid Ali Baba a ‘friendly’ visit overnight and, without going into too much detail, an hour’s vigorous scrubbing and hosing down was required before they could leave the dock. Next spring, Ali Baba will head back out into the North Sea once again for a shorter voyage round to The Hamble where James plans to enjoy relaxed day cruising with family and friends. In the meantime, James is faced with the ‘agonising’ dilemma of whether to change Ali Baba’s name – watch this space.